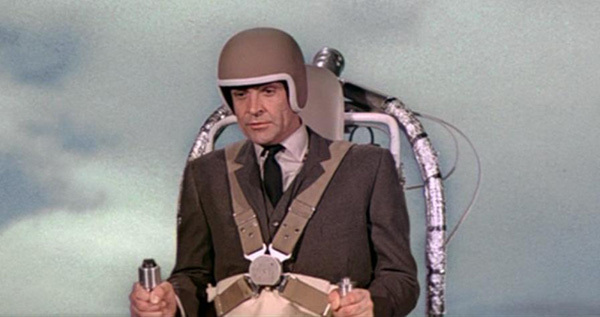 The jetpack from “Thunderball”: the peak of bad special effects humor. This weekend, “Skyfall” opens in theaters. “Skyfall” marks a remarkable 50 years of the existence of James Bond onscreen. Directed by Sam Mendes (“American Beauty,” “Road to Perdition”), “Skyfall” has already been receiving early raves. It’s hard to fill the shoes of Sean Connery, but I believe Roger Moore did as good a job at it as anyone could. This is my favorite Moore installment, and it certainly doesn’t shy away from the Cold War inspired madness of the time. While the villain’s objective of creating a new civilization under the ocean should be completely ludicrous, it doesn’t feel as unrealistic in light of climate change. Plus it’s got a hot Bond girl, and Jaws, one of the few villains in the Bond series who got to come back for another film. If only Oddjob didn’t meet his end in “Goldfinger,” him and Jaws would have made a great team of villains. This is where it all began. Bond had much less weapons to use, so he mainly relied on his own cunning. And while ejecting car seats are cool, it’s even cooler to see Bond having to use his own wits, like watching “Spider-Man” try and scale the city when his web blasters run out. And speaking of spiders, there’s a great scene where Bond battles a tarantula, which has the kind of slow-burning suspense rarely seen in movies anymore. I had the distinct pleasure to go to a beach screening of “Dr. No” while at Cannes this summer. To say that “Dr. No” has aged is an understatement. To say that because of that “Dr. No” is no longer funny or exciting to watch would be a lie. This entry was posted in 007, Casino Royale, Daniel Craig, George Lazeby, Goldfinger, James Bond, Pierce Brosnan, Roger Moore, Sam Mendes, Sean Connery, Skyfall, Top 5 on November 7, 2012 by ian0592.